Classifications provide a way to record descriptive information about the files and cases in your project. You can then use this information to make comparisons or to gather material by attribute. Case classifications let you provide demographic details about the people, places or other cases in your project. For example, classify a case as a Person and define attributes for age and occupation. File classifications are for storing bibliographical information about your files—you can import this information from reference management tools like EndNote or Zotero. When you click on Case Classifications in Navigation View, you see the case classifications that are available in your project. When you click on File Classifications in Navigation View you will see the classifications that are available in your project. Import a literature review from a tool like EndNote or Zotero. 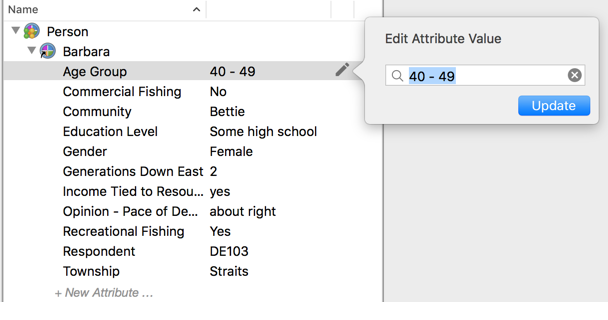 Create your own classifications (or add NVivo's predefined classifications Interview or Focus Group)—if you want to keep track of your files. When you import data from a reference management tool, the files are automatically classified and the attribute values are assigned. What is a classification sheet? When you have classified your files or cases, you can open a grid that displays the attributes for all items in a particular classification—this grid is called a classification sheet. 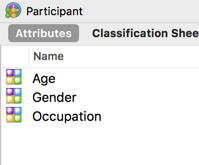 For example, you could open the Participant classification sheet and see all the cases in this classification.